Information push: Can push Twitter, Facebook, Wechat information, you can easily communicate with your friends. Replaceable watch strap: General-purpose band size, easily to replace it, you can replace it with personalized strap. 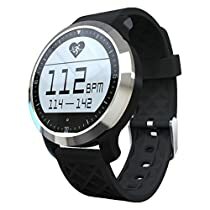 Double mode heart rate: Healthy heart rate mode and sport heart rate mode, test your heart rate in different situation, more professional and more accurate. Install App can achieve heart rate synchronization, and data statistics and management. Identify four kinds of swimming modes: IP68 waterproof, let you can wear it to do swimming, also can identify four kinds of swimming styles - Freestyle, breaststroke, backstroke and butterfly. Always can see the time: The screen is always light on, you can get time easily without doing anything; No afraid of sunlight, it shows better display effect under the sunlight. Pedometer / Sleep monitoring / Sedentary reminder: Your private management expert, monitor daily movement, track sleep and remind you to have a rest. Call / SMS reminder: When calls or messages come, it will remind you with vibration.